Note: This is the second book in a series, and whilst I will try to keep it spoiler free, I can't promise that some points raise will reveal minor events of the first novel. Yeah I kept it spoiler free guys, woo! September's returned to her normal life, after the thrilling adventure in Fairyland a year ago. Yet, she is restless, eager to return to Fairyland and reunite with her friends. When she accidentally falls back into Fairyland she discovers that it is almost in ruins and it's partly her fault. September finds a new purpose and so her adventures begins again, although not exactly as how she imagined it. The time between reading the first and second book in this series was actually quite long, but I was immediately sucked into the world of Fairyland and the adventure that occurred. This is credit to Valente's writing, which I have loved right from the beginning. It's the perfect tone for a modern day fairytale, whimsical and magical. September is such a brilliant character, and in this second book she exemplifies the process of a child growing up and understanding the works of the world. It's unusual that she doesn't learn the worldlier things in real life, but in a fantasy world, which functions differently to her life in the US, yet can still deliver the same lessons. I've always admired her courage and perseverance, but in this Valente has her learn the value of loyalty and friendship, and that not everything is good and bad - there's always a grey area. My favourite "character" in this novel though, was the narrator, because of how poetically he delivered the story. There was a lot of emphasis on growing up and discovering emotions, which children usually ignore, and I could not help but feel a sense of nostalgia as I remembered the more carefree days of my childhood. I know, how sappy. September does meet new friends and acquaintances along the way, some who actually carry a much heavier role than needed for Middle Grade. It's subtle but I found it thought-provoking. Others were okay, not as memorable, but they helped make the world a lot more believable. Fairyland is an amazing place, although you do get a lot more of it in The Girl Who Circumnavigated Fairyland in a Ship of Her Own Making. It's a place, much like Hogwarts and Neverland, where I wish I could visit and experience myself. It feels so real and every moment September spent there I stuck close to her because I could not get enough. I'm not sure why I was so surprised at the ending, because the revelation in the first one was as big as this one. The finale had such a bittersweet feeling, yet again, but it gathered all the loose ends and the messages and tied it all up with the emphasis on family and love. 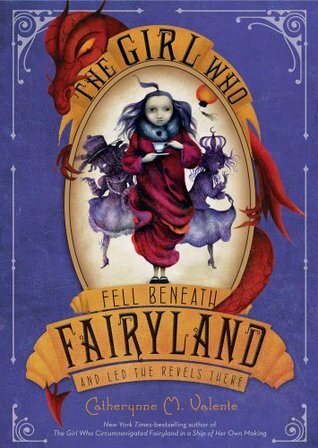 I actually loved The Girl Who Fell Beneath Fairyland and Led the Revels There more than the first book, only because I had already developed an attachment to Fairyland so revisiting it was the best adventure to look forward to. The plot had a stronger direction and it moulded into the context that the story is set in - World War I I'm pretty sure. I am constantly impressed by Valente's works and this no exception.